THIS Ishqbaaaz actress is expecting her first child; Flaunts baby-bump in latest pics! The actress, who tied the knot with beau Karran Jeet on 4th March 2017, is all set to welcome their first child. Though Navina is yet to announce her pregnancy officially but her latest Instagram pictures have confirmed that she is indeed pregnant. Recently, Navina posted few pictures on Instagram in which she is celebrating New Year 2019 with hubby Karann Jeet & friends. In the pictures, Navina is flaunting baby bump as she looks gorgeous in a black outfit. The pictures have been captioned as, "Brought in 2019 with a bang!! What a crazy night with all my favourite people in the world and the promise of a wonderful year ahead!! Cheers to great beginnings! Happy new year lovelies"
After seeing her baby bump, her fans are congratulating her in the comments section. 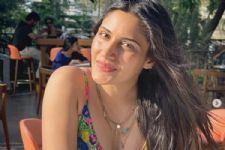 On the career front, Navina Bole rose to fame after playing the role of Diya' in 'Miley Jab Hum Tum' post which she went on to feature in various popular shows like 'Na Bole Tum Na Maine Kuch Kaha', Jeannie Aur Juju' among others and became a household name post 'Ishqbaaaz'. FASHION FACE OFF: Bhumika Gurung V/S Bipasha Basu? HOTT!! Ruslaan Mumtaz is Giving Fitspiration Goals for This NY!! In my opinion, creating such articles, especially as an entertainment portal is incredibly rude. Neither her posts nor the caption gives ANY indication of it. I was assuming that you had reached out to Navina to ask her about it. But there were no comments from her. Maybe she's pregnant, maybe not. But I think you should wait for at least some solid hint for the same. What if it is not a "baby bump"